Activist Feng Zhenghu from Shanghai was denied departure from Pudong International Airport on October 5, 2015. The border police stated that his departure could potentially “harm national security,” allegedly in connection with the 709 Crackdown. 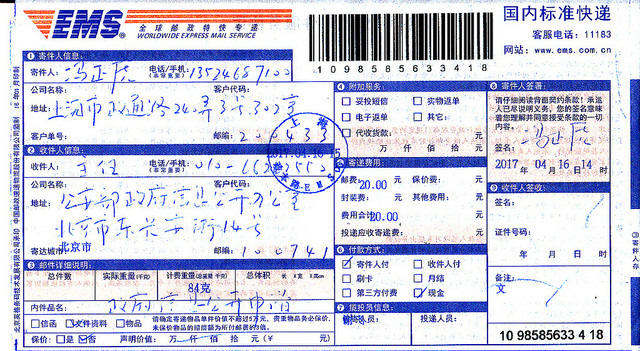 In February of this year, when Feng was granted a visa again to go to Japan, he planned to visit relatives there and bought roundtrip air tickets to depart on March 3. This time, he notified domestic security officers at the Shanghai Public Security Bureau in advance. But they did not know whether his travel restriction is still in place, because his October 2015 travel ban had originated from Beijing, not from the Shanghai police. The officers then asked Feng to change the travel dates to save him the embarrassment of being denied departure during sensitive dates (i.e., during the “Two Congresses”). Feng accepted their suggestion and changed his departure date to May 15. As it is still unknown whether his travel restriction had been lifted, Feng filed an open government information request with the Ministry of Public Security for the release of the terms of his travel restriction order—i.e., information on the year, month, and date when this ban is valid until.